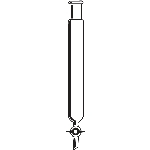 General purpose column has a Teflon stopcock and a top outer joint. Glass wool (not supplied) is used to support column packing. 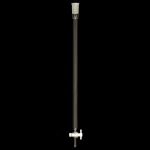 Columns are constructed using medium wall tubing. ID 1/2in. Length 18in. Top joint 24/40. PTFE bore 2mm. ID 3/4in. Length 18in. Top joint 24/40. PTFE bore 2mm. ID 1 1/2in. Length 18in. Top joint 24/40. 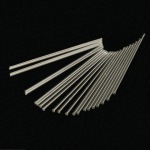 PTFE bore 2mm. ID 2in. Length 18in. Top joint 24/40. PTFE bore 2mm. OD 2in. Length 24in. Top joint 24/40. PTFE bore 4mm. ID 3in. Length 18in. Top joint 24/40. PTFE bore 4mm.